Archaeological findings have proven settlements on the grounds of modern Prachatice and its area from prehistoric times. It seems that as far back as 10,000 B.C., there were groups of hunters and gatherers that lived here, whom we now consider to be the area‘s first “inhabitants”. Further archaeological research has also proven settlement in the Early Bronze Age (12,000 to 750 years B.C.) as well as in the late (700–400 years B.C.) and early Iron Age (400 B.C. to the turn of the calendar). The Medieval settlement and formation of Prachatice is closely tied to the territory upon which stands today‘s Old Prachatice (on the northern side of the city today). This town‘s location enjoyed an extraordinarily advantageous position: it was at the end of a trade route between it and Passau in Germany, along which precious fabrics, spices, tropical fruits, and especially salt were transported into the Bohemian lands. Salt was an essential substance in the Middle Ages, being the only way to preserve food. The trade route, known from the beginning of the 16th century as “gold” for its economic importance, was most very likely used as early as prehistoric times, but the first written evidence of it comes to us from the year 1010. The route is mentioned in the deed „About the way from Passau to Bohemia“ of the Roman King George II. Another fact that played an important role was that the area of today‘s Old Prachatice, including the territory along the border, was under the administration of the Vyšehrad Chapter from the end of the 11th century. This important church institution, seated at Vyšehrad in Prague, was gained by King Vratislav I into his own management in 1088, including the right to levy taxes to travelling merchants. These taxes, divided between the Chapter and the city, were the reason that Prachatice became one of the richest cities in Bohemia over the next several centuries. he location of Old Prachatice soon could no longer match the growing trade, however, so the Vyšehrad Chapter decided to found a new market settlement below Libín Mountain. This became the later foundation of today‘s Prachatice at the turn of the 13th–14th centuries, then a modern Medieval city. 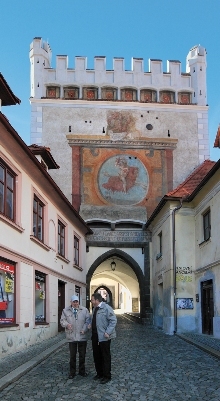 The original market settlement soon became unimportant, as reflected in its name – it has been known as Old Prachatice ever since. The Golden Path permitted Prachatice to continue blossoming throughout the relatively quiet period of the 14th century. King Václav IV granted the city the right to store salt in 1382, which meant that other towns could only buy salt from Prachatice. The city continued to get richer, and building activity grew. This is when the massive fortification walls were built, work on building the church of St. Jacob began, the school was founded, and so on. Prosperity brought with it the development of education and the educated class – Prachatice is firmly bound with the name of Jan Hus (John Huss), the revolutionary religious reformer who likely earned his basic education here, and Křišťan (Christian) z Prachatic, a pedagogue and later the rector of Charles University. 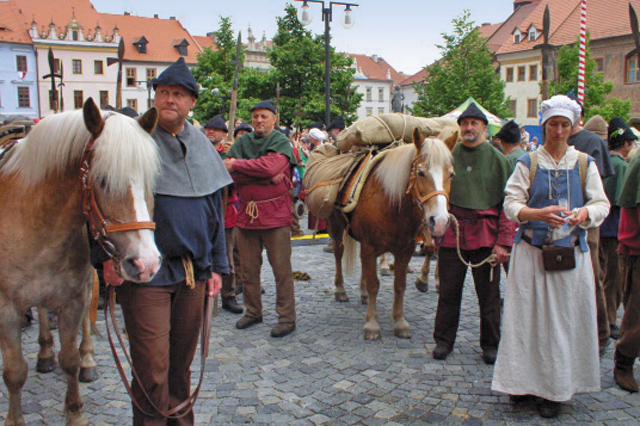 At the beginning of the 15th century, just like in many other cities in Bohemia, the city of Prachatice was interrupted by the Hussite Wars. A consequence was the marked decline of trade along the Golden Path, and the Vyšehrad Chapter lost nearly all power over the city. 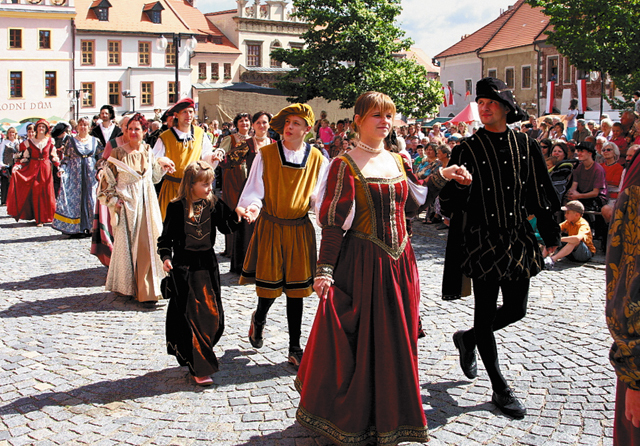 Prachatice was strongly anti-Hussite in the beginning of the Hussite conflicts, but Žižka‘s army repeatedly conquered the city, and for several years it became a seat for this very radical group of “the followers the chalice”.